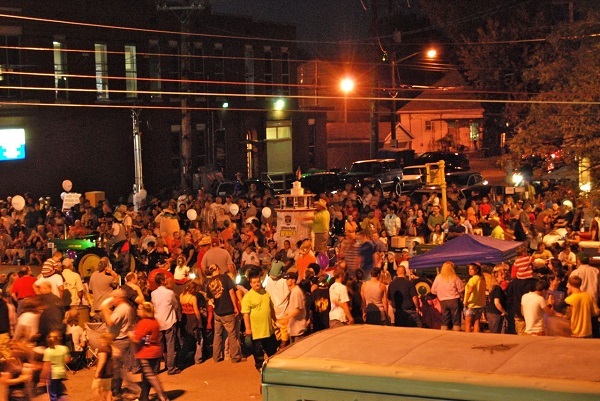 Every October, Evansville’s west side is transformed into a festival food-lovers paradise as Franklin Street welcomes the annual West Side Nut Club Fall Festival. As a major fundraising activity for numerous churches, civic organizations, and charities in the Tri-State area, the Fall Festival boasts over 126 food booths along the four-block Festival grounds. Since the founding of the West Side Nut Club in 1921, members of the Nut Club have lent their time and talents to many different civic activities over the years. Perhaps the most well-known of their endeavors is the Fall Festival. The first festival took place in 1924 and has steadily grown every year to the week-long festival we all enjoy, providing the community with carnival rides, amateur talent contests, free entertainment, a parade, and of course, food. Since the beginning of the festival, over $4 million in charitable funds have been returned to the community. Lin-Gas’ commitment to the Fall Festival reaches back to the early 1990’s when we began supplying the propane for the grills and deep fryers that keep the festival running smoothly, year after year. Our involvement is an extension of the commitment that Charles Link, Sr. felt toward his native west side. As a lifelong West-Sider, Mr. Link had long supported various organizations such as churches and little league teams, and wanted to keep his support local to his friends and neighbors. Because he did business year-round with the vast majority of people supporting the Fall Festival, it was only natural for Lin-Gas to extend our support to the festival, as well. Whether you’re looking for traditional festival food like funnel cakes or want to try the festival’s more exotic fare – brain sandwiches, anyone? – one thing you can be assured of: propane powers the vast majority of the food booths. Lin-Gas begins preparing for the Fall Festival well in advance of the opening day. Part of our preparations include weeks of sandblasting and repainting the tanks that will be used by the food booths. We also safety-test each tank to assure that it will perform as expected and provide the food booths with a reliable cooking source. Each morning of the festival, our drivers deliver and set up fresh propane tanks for each booth, well in advance of the festival’s opening time. For many of our drivers, this time commitment is over and above their regularly scheduled hours, and most put in overtime during the week of the festival. Of course, it doesn’t hurt that they get to enjoy the food while they’re there! Providing the Fall Festival with propane is another way Lin-Gas keeps in touch with our roots, echoing Charles Link, Sr.’s love and commitment to his friends, neighbors, and customers from the West Side. The West Side Nut Club Fall Festival is a significant investment of time and effort for the betterment of the community, and Lin-Gas is proud to be a part of this long-standing Evansville tradition.